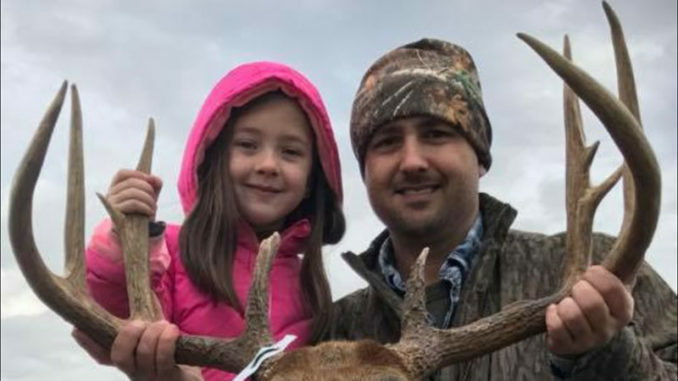 Benji Nelson and his 7-year-old daughter, Rylee, pose with the big 12-point Catahoula Parish buck he shot on Dec. 29 near Sicily Island. 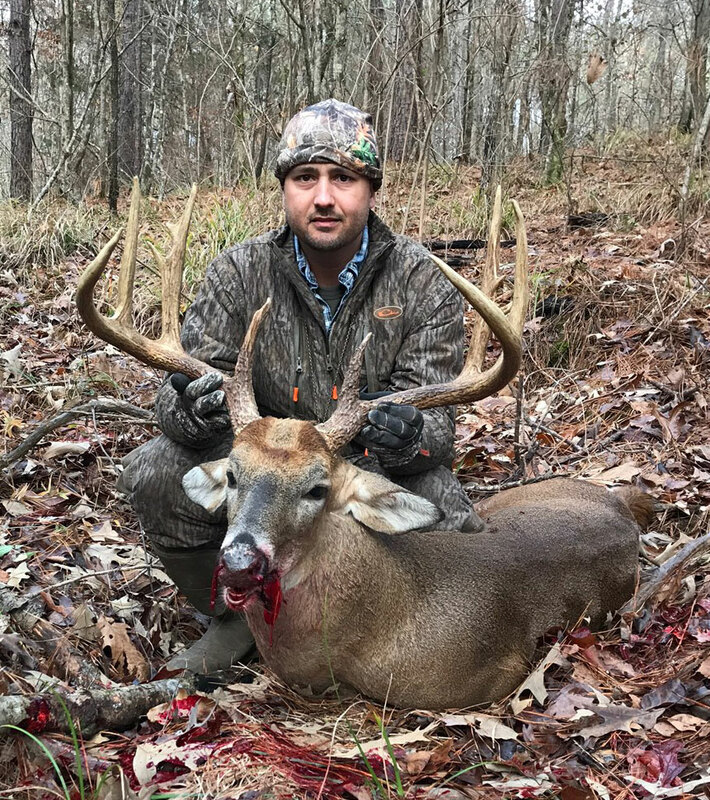 Late in December, Benji Nelson knew time was getting short to kill a wily old buck he and his family had been hunting for the previous three years in Catahoula Parish. The elusive 6 ½-year-old deer had only been photographed at night by multiple landowners in an area near J.C. “Sonny” Gilbert Wildlife Management Area, and the 38-year-old Sicily Island resident was really starting to wonder if anyone would ever take it down. 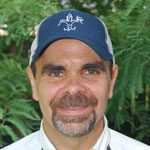 Nelson’s eventual encounter with the 170-class stud on Dec. 29 got off to a fortuitous start as he headed for a box stand located on a hill on the private land he hunts near Sicily Island. So Nelson abandoned his original plan, and headed south about 1 ½ miles to a different box stand overlooking three ridges, and arrived shortly after daybreak. About 60 yards out, he had a pile of corn and a trail cam in place. He blew a grunt call a few times, but didn’t see any activity — until he spotted a doe running down the ridge to his right around 7:45, heading his way. “Just as she topped the hill, I heard something. I turned and looked back to my right, and I saw him — he was trailing right behind her,” Nelson said. “He come running off the top of that ridge and came down in the bottom and started up, then started slowing down — he realized where he was at. He was coming up to that corn at the opening — they associate that with humans. The doe continued on its path, grabbing a quick bite of corn but never really slowing down. Benji Nelson, of Sicily Island, poses with the big 12-point Catahoula Parish buck he shot on Dec. 29. The big deer stretched the tape to more than 173 inches, and is currently in first place in Simmons’ Sporting Goods muzzleloader division. “When he saw her doing that, he turned right and was going to go around where the ridge falls off to cut her off. When he started to go, he took two steps straight up the ridge and turned right,” he said. “When he did, I could see his horns and his back end. As the big buck started heading in the opposite direction, Nelson realized he might not ever get a second chance at a deer he’d been literally chasing for years — and decided to roll the dice with a 60-yard shot at a very small target. His .35 Whelen was up to the task, and the buck lunged twice and then stopped behind some brush. So Nelson jumped down from the stand, reloaded his gun and ran to get a better vantage point. The mainframe 8 with two kickers on each G2 was worth the wait: With an inside spread of 23 inches and 5-inch-plus bases, the 190-pound deer stretched the tape to 173 ⅜ inches at Simmons’ Sporting Goods in Bastrop, where it’s currently in first place in the muzzleloader division. At Spotted Dog in Columbia, the big buck scored 173 ⅞ inches of bone. 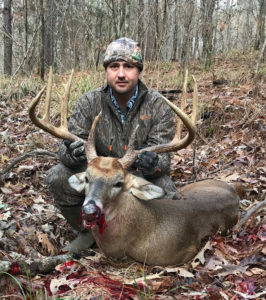 The big 12-point is destined for a place of honor in his home, Nelson said, noting it easily beat his previous best buck, a 13-point he shot seven years ago that scored 157. “I’m going to mount him. He’s going to go right in the middle of all of them,” he said. “That’s something for us in this area — we get good deer, but if you kill a 173 that’s a once-in-a-lifetime deal.